Grilling vegetables is a great way to bring out sweet, toasty, caramelized flavors that other cooking techniques won't. There's very little prep involved; simply toss the raw veggies in olive oil, sprinkle with kosher salt, and grill. 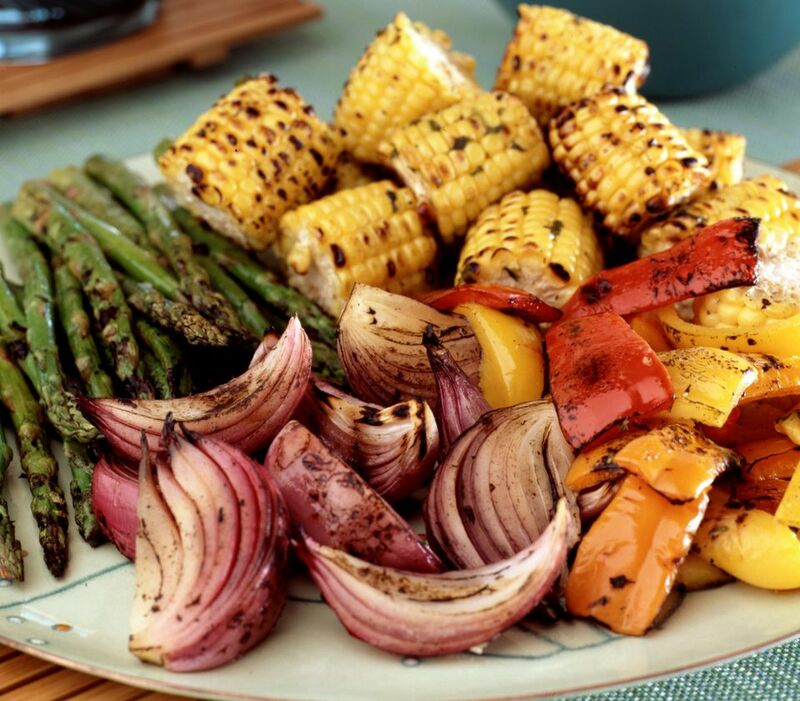 Since vegetables are delicate, they should be grilled at a moderate temperature on a very clean grill. Any cooking debris left on the grill will leave an unpleasant flavor on the vegetables. Unless otherwise noted, most vegetables can be grilled uncovered, with the grill lid open, to avoid a build-up of smoke. A medium-high grill is best for grilling most vegetables. If you have a gas grill, this is about 400 F to 425 F. If you're using a charcoal grill, gauge temperature by holding your hand four to five inches above the grill and count the seconds until you can't hold your hand there any longer. For medium-high heat, you should be able to hold your hand above the grill for 4 to 5 seconds. If it's too hot, let the coals cool down. Some vegetables are better over medium heat. On a gas grill, that's about 350 F. If you're using the hand method, that's holding your hand above the grill for about 6 to 7 seconds. Skewers can be helpful when grilling smaller vegetables. They prevent vegetables from falling through the grill grates and make it easier to turn smaller vegetables. Stainless steel kabob skewers are best for grilling because they are sturdy, reusable, and easy to flip. Take caution when serving food directly off the skewers since the metal will become extremely hot. Bamboo skewers are another option. Soak them in water for 30 minutes prior to grilling or they will turn black and possibly catch on fire. Corn: Corn can be grilled with the husks still on or with the husks and silk removed. Cooking without the husks will result in lightly blackened and caramelized kernels, bringing out tons of sweet corn flavor. Grill corn over a medium grill for 4 to 5 minutes, turning frequently. Eggplant: Cut the eggplant into 1/2-inch slices. Brush slices with a simple balsamic vinaigrette, toss with kosher salt and grill over a medium-high grill for about 5 minutes per side. Asparagus: Trim off the tough ends of the asparagus, toss spears in olive oil and kosher salt and grill for 4 to 5 minutes over a medium-high grill. Rotate the spears and grill another 4 to 5 minutes. Spread the spears cross-wise against the grates to prevent any from falling in. Onions: Sweet onions like Vidalias, Mauis, or Walla Wallas are great for grilling, as are red onions. Peel them, cut them into 1/2-inch slices, toss them in olive oil and kosher salt, and cook over a medium-high grill for 2 to 3 minutes, then turn and grill 2 to 3 minutes longer. A skewer can be handy to hold the rings of the onions together on the grill. Bell peppers: Remove the core and seeds and slice each pepper into about four separate sections. Toss with olive oil and kosher salt and grill over medium-high heat for 4 to 5 minutes. Turn and grill 4 to 5 minutes longer. Cabbage: Cut the cabbage in half and then slice each half into thick 1-inch slices. Toss with olive oil and kosher salt. Skewer each big slice to keep it from falling apart. Grill over a medium-high grill for about 10 minutes, then turn and grill for another ten minutes. Zucchini and yellow squash: Cut into 1/2-inch pieces lengthwise, toss in olive oil and kosher salt, and cook over a medium-high grill for 4 to 5 minutes. Turn and grill another 4 to 5 minutes longer. Tomatoes: Skewer cherry tomatoes and grill whole for 3 to 4 minutes over a medium-high grill. Turn them frequently for even cooking. Plum tomatoes work well on the grill too. Cut them in half the long way, remove the seeds, grill for four minutes, then turn and grill for four minutes longer. Mushrooms: Toss white or brown button mushrooms with olive oil and kosher salt. Skewer and cook them over a medium-high grill for 7 to 8 minutes, turning frequently. A whole Portobello mushroom cap is tasty on the grill. Grill it smooth-side-down for 8 to 9 minutes. Cauliflower: Cut the cauliflower into big florets, toss in olive oil and kosher salt, and then skewer. Grill over medium-high heat, turning often, for about 10 minutes or until the cauliflower is tender and lightly charred.